Happy Sunday to you!! Do you have a recipe that is too intimidating to make? You want to make it, but your afraid too because you know the outcome will come out like crap? Honestly, I don’t know why we or at least I think that way? It’s not like it’s going to hurt me or anything, yet I don’t make it. Today’s recipe is one of those recipes! I spent years looking through bakery windows dreaming of making one of those gorgeous tarts, secretly wondering how do they make them so pretty? Thinking, I wonder if I can do that? No, I doubt it! Well today that has changed! I have made, well my 2nd tart ever and it turned out fabulous and I think it looks pretty too!! 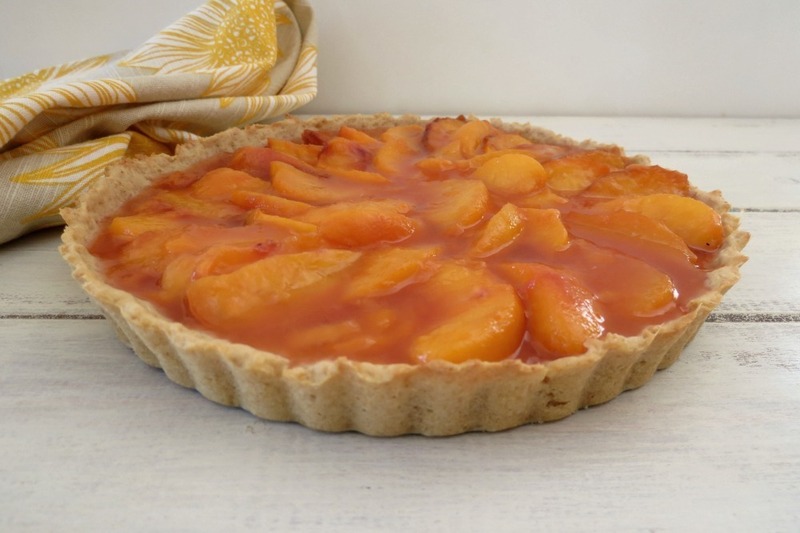 This is my simple, easy, tasty and reasonably healthy peach tart. I am so proud of my tart!! The flavor of the peaches is simply amazing. I have said it before, but it’s worth saying again, thank you Mother Nature for giving us such wonderful fruit! I bought the peaches from Trader Joe’s and I have to admit they are one of the best peaches I have ever had. Weird coming from a store, but they are so sweet, that you barely need any sugar in this recipe. I have been having a peach every day for morning snack this past week. I was down to the last four, when I realized it was use it or lose it time, so I decided on a tart instead of a pie. This is much easier to make than pie! The crust is buttery, flaky ans super duper easy to make. I just added a pinch of brown sugar, egg substitute, flour and butter. Mix it all together and place in my tart pan. Since the crust is soft and easy to work with , it made it a snap to place in my tart pan. You just need a pinch of patience forming it up the sides of the pan. It doesn’t have to be perfect and if the dough gets a hole it in, just add the dough to cover it. Trust me, if I can make this, so can you. The whole dough making part took less than 10 minutes to make it. Then I just baked it for 10 minutes until it became lightly golden. 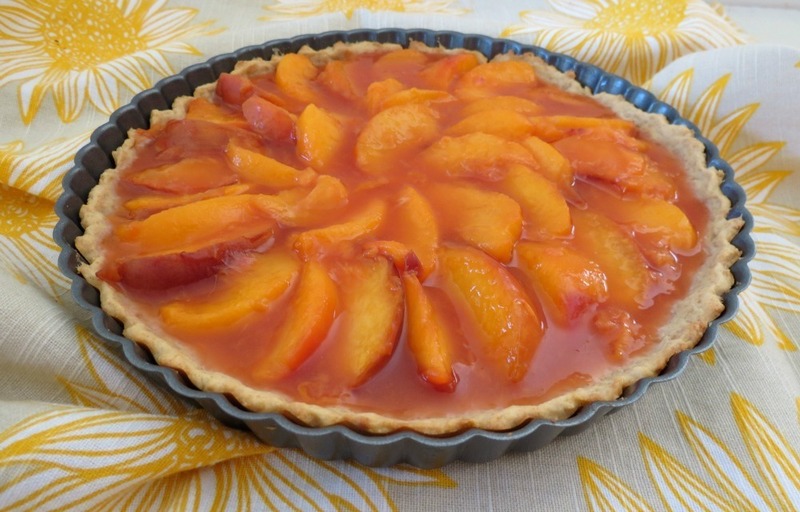 While my tart crust was cooling, I made the peach filling. Again super easy! In a skillet, I added peaches, cornstarch, stevia and water. Carefully stirring the peaches as they get all warm, juicy and thick. Once the consistency was what I wanted, I let the peaches rest to thicken up a bit and to cool down. 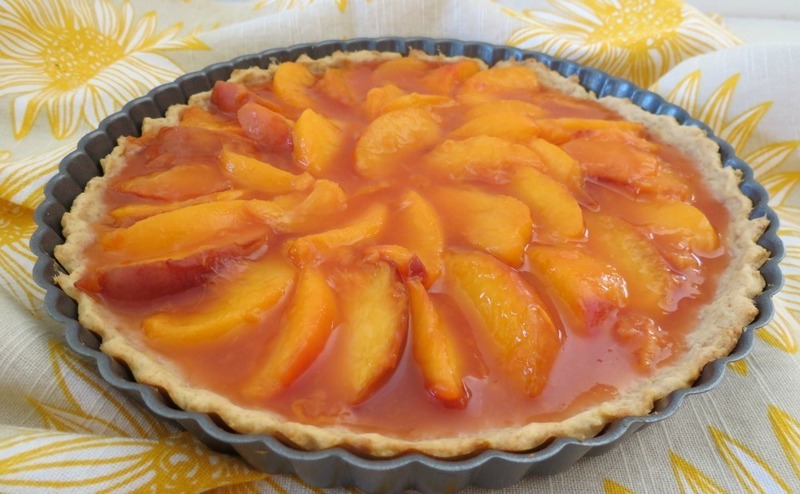 I decided at the last-minute to place my peaches in my tart to make a pretty design, however that is not necessary. Work with the peaches however you like. Just be sure to add all of the juices that are left in the pan. You will find some of the peach skins peeled off. If they looked loose, I peeled them off of my peach, super easy to do, and then I ate it. I think it’s easier to peel the skin this way, then peeling the skin of the raw peach. I wanted as nice of a shape peach as I could get! One of the best parts was there were a few remnants of peach skins and mashed peaches in the pan, so I added them to some yogurt and had that as my snack. Yum! It tastes like peach pie! I love it!! 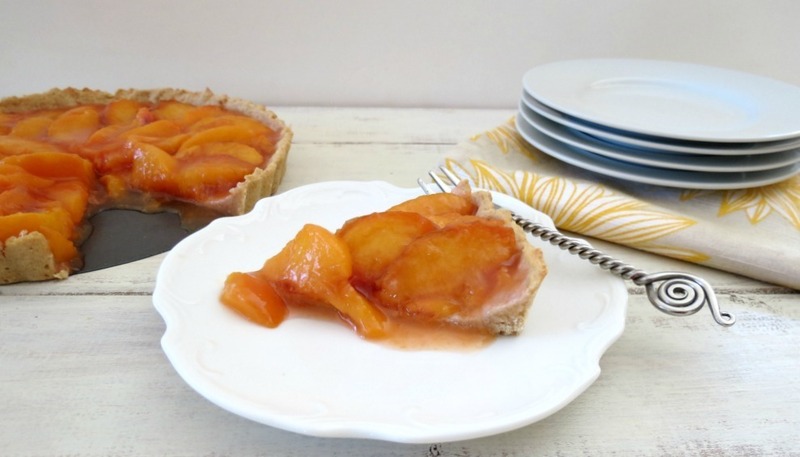 A flaky buttery crust filled with fresh, sweet, juicy peaches. In a bowl, add the all purpose flour, whole wheat pastry flour, butter, brown sugar and egg substitute; mix with spoon until well combined. Place dough into tart pan and press the dough firmly against the bottom and sides of tart pan. You will need to work the dough a bit. Bake in oven for 10 minutes until lightly golden. Meanwhile; in a large skillet, add peaches, stevia, water and cornstarch. Cook until thick and bubbly about 10 minutes; stirring constantly, be careful not to smush the peaches. Let the mixture cool for about 10 minutes. 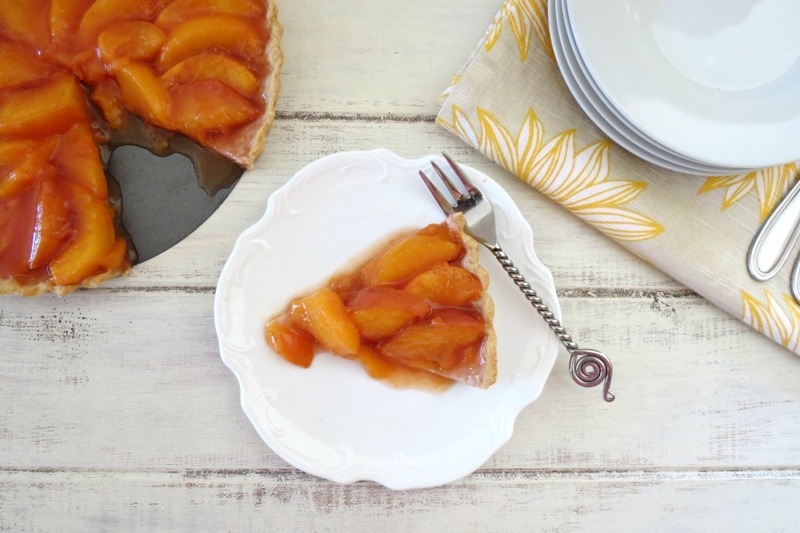 Carefully pour or design the peach mixture over the tart. Spoon in the juices left in the skillet, let cool. 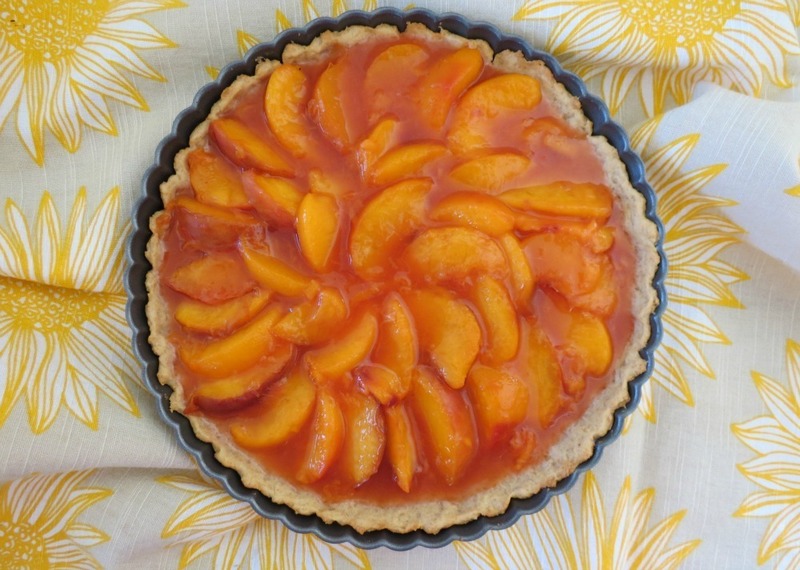 Once completely cooled, store the tart in the refrigerator for at least an hour before serving. This will firm up the tart. After several hours the tart will firm up more. I had a lot of fun with this recipe. I really am proud of myself. You should try making a tart, using my same concept with your favorite fruit! I have to say I am tickled pink that it cooled off to the 80’s that I was able to do some baking. I missed it! Enjoy the rest of your Sunday! Stay tuned tomorrow for a recipe I had fun making and it’s quick and easy too! Jen it DID turn out fabulous and I would have never known this was your 2nd one – ever. Amazing. And the peaches look so juicy and delish! Thank you Averie! I appreciate it! I am having fun making tarts, can’t wait to experiment more with different kinds of crusts and fillings. Looks beautiful! It’s almost peach season, and I’m excited to start seeing them at the farmers markets. The peaches have just come into season here and I always forget how much I love them! Yum….looks beautiful! Love the simple ingredients! hank you Kristi! 🙂 Thought of you yesterday, I was in SF and it was just gorgeous! I think next week, I’m going to make a trip to the SF Farmers Market! WOW! You did a beautiful job with this AND I love peaches! Tis the season! YUM! Wow, this is my kind of dessert, I always choose a fruit dessert over all else! Warm with a dollop of whipped cream please!! I choose fruit myself. However if you offered me a big fat piece of chocolate cake, I wouldn’t turn that down! 🙂 Especially your avocado chocolate cake! I’ve never made a tart before, but this recipe looks like a wonderful tart! 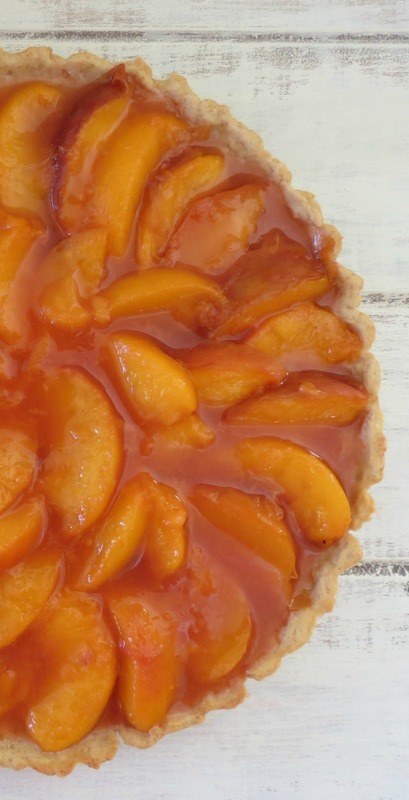 I’ve been getting the most fabulously juicy, sweet peaches from Whole Foods and I bet they would be incredible in this tart. I love the short ingredient list, too! Ohhh, you have to try a tart, it’s so easy to make. I won’t ever be intimidated again. The peaches sound wonderful. I need to make a trip to Whole Foods. Ohhh, a quiche, I never thought of that! Great idea! I’ll have to try that next! Peaches are finally in the store here! This is a beautiful summer dessert!! Thanks Cathy! I love peaches and every year, I forget how wonderful they taste! I’m out, but need to get more and soon!